Should You Replace Your Passport If The Number Was Accessed In A Breach? Just one month ago, yet another hotel chain was added to the growing list of hospitality data breaches. It’s a growing list and one that hotel guests hope they never make. According to Starwood Hotels & Resorts Worldwide, hackers gained access to their guest reservation database including Westin, Sheraton, Aloft, and W hotels among others, as early as 2014. Marriot International had purchased Starwood, with the combined total number of hacking victims currently at 500 million. Hackers walked away with massive amounts of guest information, including names, birth date, payment information, phone numbers, email addresses, and possibly the most disturbing hit of them all–passport data. The hospitality industry continues to be a bonanza for hackers looking to steal and sell identities on the dark web. The difference with this hack is the passport data of millions of travelers could now be in the hands of nefarious actors. It’s unsettling at best to know one’s passport information is out there somewhere in cyberspace, much less figuring out what to do about it. Changing email or financial accounts after a hack is one thing; stolen passport data is another matter. There’s a possibility a stolen passport number can be used to get a new one, and what scary stuff might the new user do with that passport? The answer to that question is different depending on who’s being asked. The State Department believes the only reason for concern is if one’s passport is physically stolen. On the other hand, the Identity Theft Resource Center believes there’s a need for concern that a stolen passport number can be used to create a fake identity. For those whose passport data was heisted, the decision to report the theft is currently up to the individual. The information below can assist those who want to be proactive about its potential data theft. 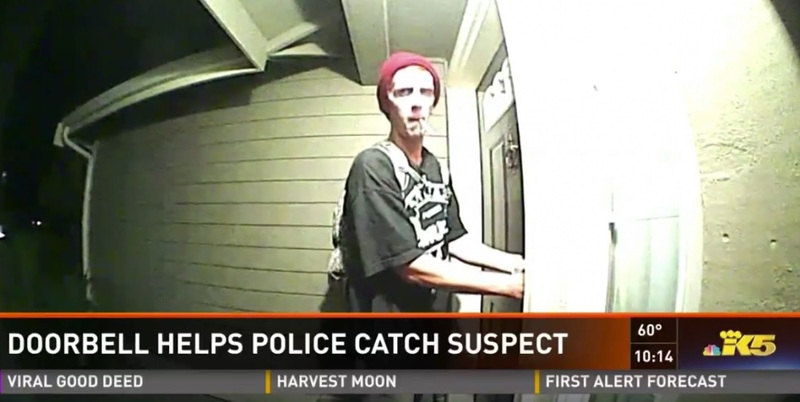 Call the US State Department at 1-877-487-2778 or go online at https://pptform.state.gov/ to report the theft. In 2-4 weeks you will have a new passport and be able to travel internationally again. However, if you are concerned about being stuck in a foreign country because someone used your stolen passport number from a data breach to create a fake identity, you should replace it. As with all of these instances, it’s certainly better to be safe at home, than sorry across the border. How secure is your Wi-Fi connection at hotels? Everyone loves a free night in a hotel. That’s why we sign up for loyalty programs. But those eager ones raking up the points at the Radisson hotel chains should be aware they may have had personal information that was stored for that hotel chain’s loyalty program accessed by unauthorized parties…or hackers for short. The company announced recently that their systems were accessed in September and personal information was stolen. 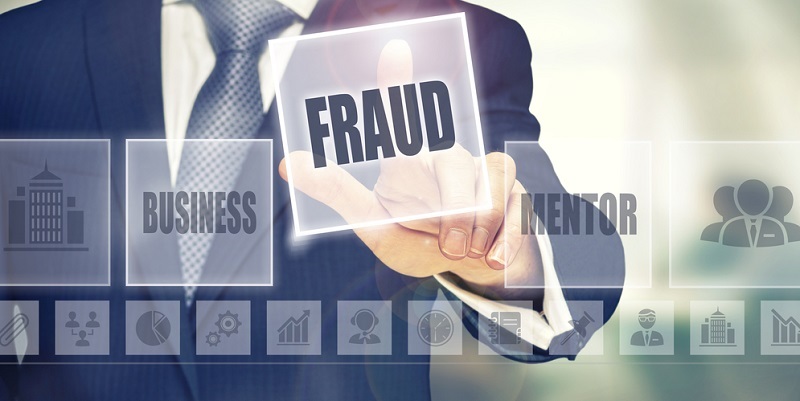 While no payment card information or other financial information or passwords were included in the accessed data, the loyal guests’ names, addresses, email addresses, telephone numbers, frequent flyer partner numbers and other information was. Though the company says only a small number of members was affected. Being blamed for the intrusion are some employee accounts that had access to that data. Those accounts were fraudulently accessed by the intruders. While it’s not stated exactly how they got access to those employee accounts, the most likely culprit is phishing email. Ok, we know that it’s getting harder to identify phishing these days, but it still isn’t impossible. The number one way to avoid being a victim is to not open links or attachments that you are not expecting to receive…no matter who sends them. If you have any doubt what-so-ever about the legitimacy of a link, pick up the old-fashioned telephone sitting on the nightstand next to that hotel room bed and call the sender. If that isn’t a reasonable option, send an email to them independently of the one you received. In other words, don’t reply to the original one. Use a new window, type in the address you are sure is the right one and ask that way. Texting is another, safer option. As the hackers find out more and more information, via this way, social media, networking, or other types of social engineering, they are able to craft very targeted email messages to us. By using information that personalizes the messages, the recipients are more likely to click on links and attachments. Be craftier than they are. Don’t click them. 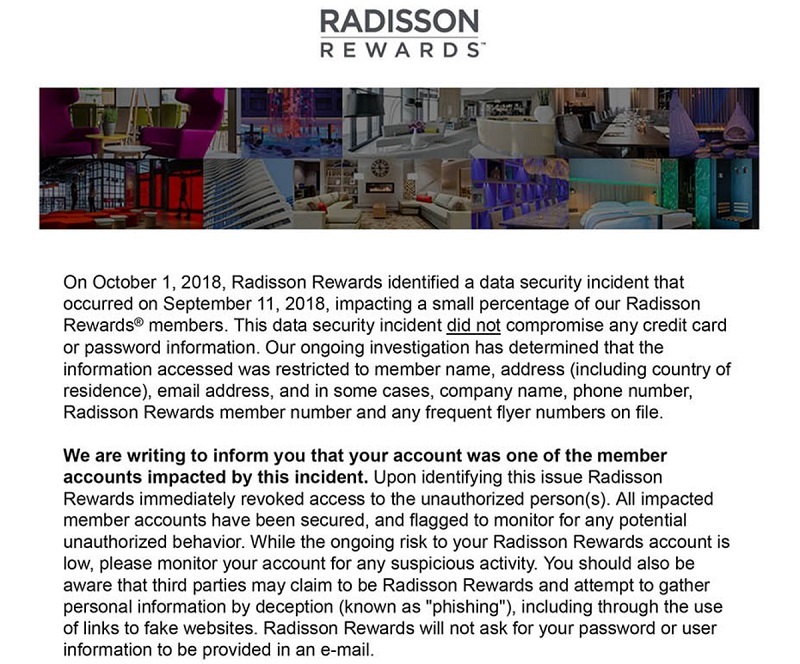 While no passwords were reportedly part of this breach, it’s not a bad idea to change yours, if you are a Radisson Rewards member. Make sure it’s at least eight characters, has upper and lowercase letters, and includes a number and a special character. And if you have the option to use multifactor authentication on any online account, use it. 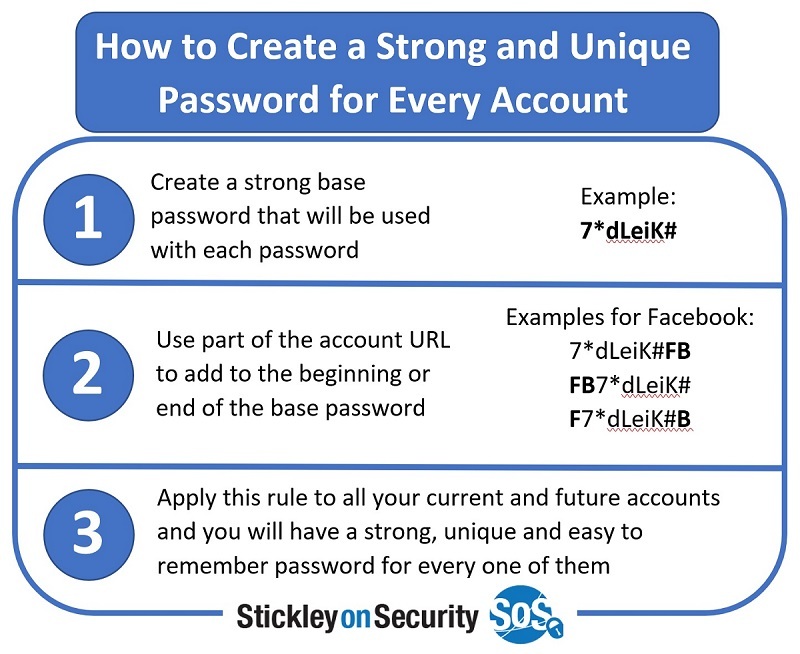 This will prevent anyone from accessing your accounts without a second step to authenticate. 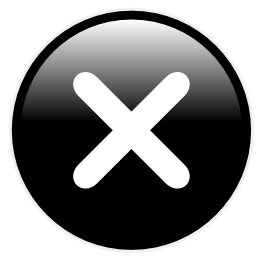 Radisson revoked access to the unauthorized person(s) and flagged the affected accounts. The Radisson chain includes Radisson, of course, but also Park Plaza, Country Inn & Suites, and Park Inn hotels as well. Hospitality has been hit again. 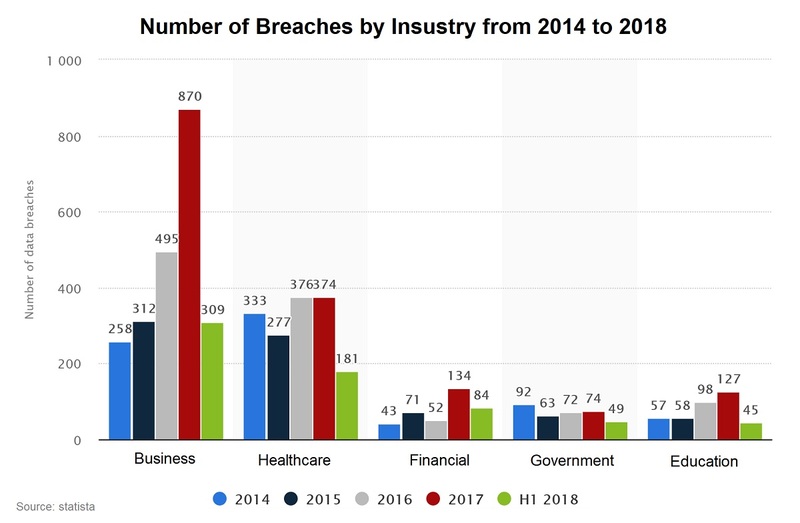 This time, if it isn’t the largest data breach on record, it is certainly right up toward the top. Marriott International announced this week that information of guests reaching up to 500 million was exposed in a breach of the Starwood properties guest reservation system. And it wasn’t just a short-term breach…the intruders may have been lurking around since 2014. Unfortunately, it affects more than guests who actually stayed. It affects anyone who made a reservation from 2014 up to September 8, 2018. Information that was exposed includes pretty much anything you’d give to a property to make a reservation: Names, dates of stay, payment card information, address, email address, loyalty card number, password, passport numbers if provided, and any information stored in the loyalty program database that includes birthdate, gender, and stay preferences. So what can you do if you were included in that massive group of victims? Monitor payment card charges diligently for at least the next year. If you see anything amiss, contact the financial institution right away and get it resolved. Change your account password for your Starwood loyalty program account. Since Marriott recently acquired Starwood and their loyalty programs were merged, you should consider changing your Marriott loyalty account password too. Keep an eye your loyalty club account. There have been instances when intruders steal your award points and exchange them for free nights on you, gift cards, or other awards. Sign up for the free services Marriott is offering. They are providing one year of services from WebWatcher to affected guests. This service monitors internet sites for shared personal information and alerts the customer if any is found. In addition, Marriott will provide fraud consultation and reimbursement at no charge. Report your passport as stolen and get a new one. You can go to the State Department website for information on how to do this. It can be reported online, via mail, or by phone. 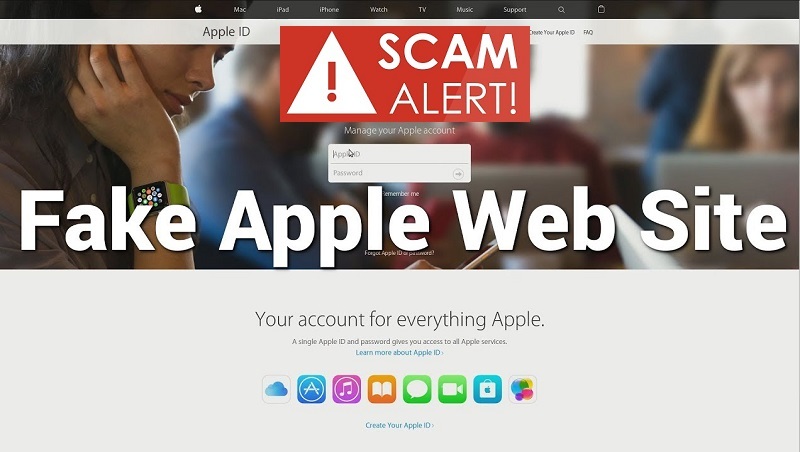 Watch for targeted phishing attacks using information contained in this group of details. The more specific information included, the more likely you will click on a link or attachment in an email. 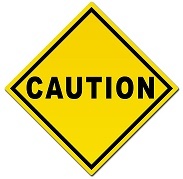 If you are not expecting a link or attachment, or even if you are, be 100% sure it’s safe before you click it. Hover the mouse pointer over it to make sure it’s going where you expect it to or hold down on it for more than 3 seconds if you’re on a mobile device. If it’s a “phishy” looking link, don’t click it. If you are changing any details in your account, go directly to the Starwood or Marriott site and log into your account. Don’t click links that request personal information. Now that the cat’s out of the bag on this, you may receive all kinds of messages using information from this breach. Use extreme caution when responding to any of them and don’t “reply” to the emails. Instead, get the phone number off Starwood’s website or contact them some other way not using information in any email, just to be on the safer side. If you have additional questions, there is a dedicated call center set up for this incident. Marriott is sending email letters out to those affected on a rolling basis starting November 30. Starwood properties include W Hotels, St. Regis, Westin, Element Hotels, Aloft, Sheraton, The Luxury Collection, Le Méridien, Four Points by Sheraton, Design Hotels, Tribute, and timeshares branded as Starwood. A technology created pre-1940’s has grown and refined over time to become RFID (Radio Frequency Identity Device) we all know and use every day. RFID “tags” are planted in credit and banking cards we use on a daily basis. 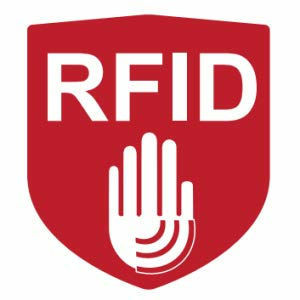 The term RFID is used to describe various technologies that use radio waves to automatically identify people or objects. 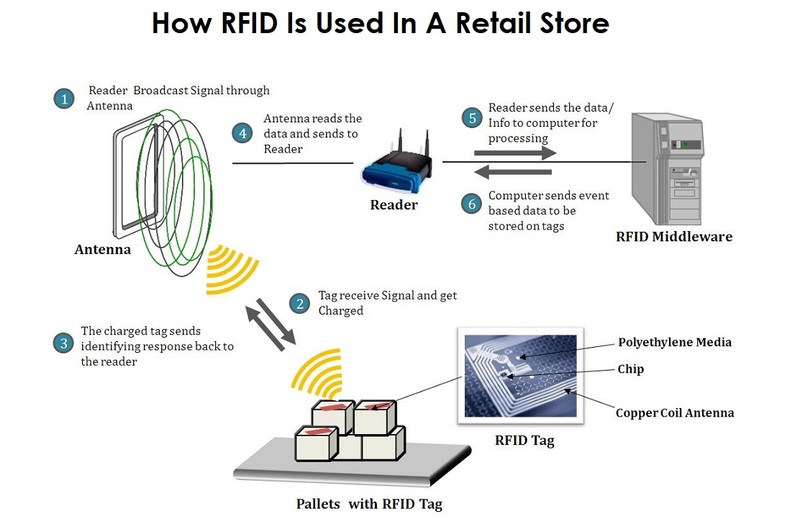 RFID technology is like the bar code identification systems we see in retail stores every day. However, one big difference between RFID and bar code technology is that RFID does not rely on the line-of-sight reading that bar code scanning needs to work. All it needs is to be nearby to be detected. Don’t let the size fool you either. An average RFID tag only stores 1KB of information, but that one tiny kilobyte is enough to store your Social Security Number, name, address, credit card details, and much more. The fact is that RFID is a rapidly growing technology that we as consumers need to understand and protect the information they contain. There are countless ways we use RFID on a daily basis, often without realizing it. Passports and other identifying documents; payment cards including contactless payment; bar codes; and those key and time cards you use to get into buy products; tracking pets and humans; inventory management, and much more. That’s a ton of data available with a minimum of effort. That’s great of course, until one day that helpful RFID technology is used against you. Chip or RFID, there are steps you can take to stop attacks at your ATM or POS (point-of-sale) device/pin pad. Those credit and banking cards are chock-full of chips and magnetic strips waiting to be stolen at POS devices. Make sure the ATM or terminal looks like you’d expect it to – no mismatching or extra parts attached. Check the stability of the actual device you’re sliding your card into. It should feel sturdy and nothing should be loose. Shield the pin pad when putting in your password. Cameras can actually be hiding at the POS or configured elsewhere in the store – likely behind and above you – to capture your data input. Use ATMs that are protected inside a building. If you’re using one at night, make sure the area around it is well lit. 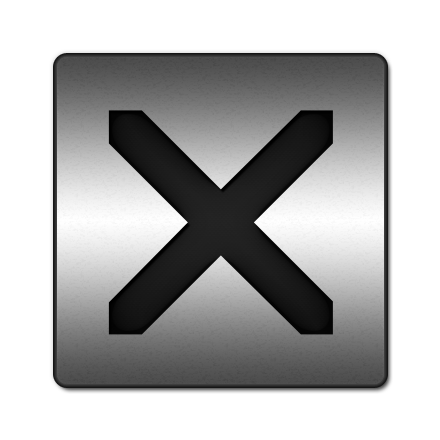 Quite simply, almost any type of metal product – including aluminum foil – can block RFID signals from transmitting. However, there are many ways to block RFID without cornering the market on aluminum foil. Someone intent on grabbing your RFID data may brush by you in a crowded store – it’s that easy. Depending on the type of RFID system used, an attack can work from inches away to 50+ feet or more. There’s no shortage of RFID-blocking products currently on the market. There are protective passport wallets, common-looking wallets for men and women, including the beloved fanny pack and other types of bags. Make sure to keep your work ID badge safe at all times. Don't leave it exposed in your car or on your desk. 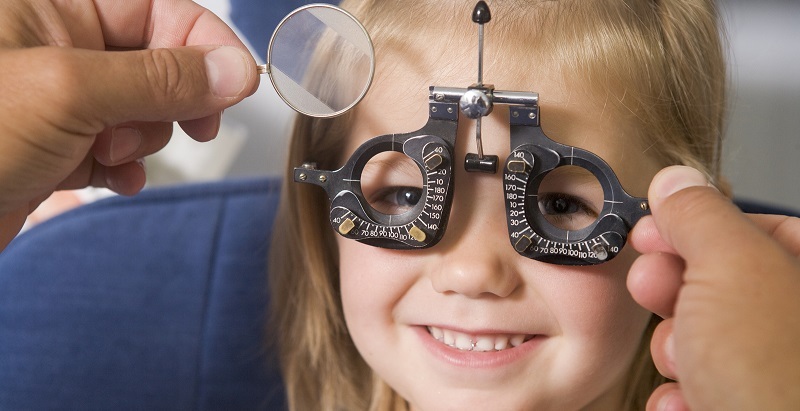 Tuck it away somewhere safe and out of sight when it's not on you. The options above are typically lined with metal to be effective although some offer added RFID protection options by way of design – the choice is yours. So much for flying the friendly skies. This past month, Air Canada announced that a minimum of 20,000 Canadian residents using their airline had their PII (Personally Identifiable Information) stolen. The PII was stolen from the Air Canada mobile app accounts. Immediately after discovering the breach, Air Canada released a notice to its app users “…we have locked all Air Canada mobile App accounts to protect our customers’ data.” However, those customers caught in the hack have much bigger worries than accessing a locked app. The hack was first noticed after a high incidence of “unusual login behavior” was detected. Air Canada acted immediately by informing customers who may be affected and by locking their apps and posting a notice on its website. The Air Canada mobile app welcomes users to store an abundance of PII and that’s exactly what hackers stole. Just some of the hacked info includes names, email addresses, birthdates, and unfortunately, passport information. Passports include country of residence, nationality, ID numbers, and expiration dates. Due to encryption, the airline believes no financial data was compromised. For now, what exactly hackers plan to do with that PII is known only to them. The airline app now requires users to change their passwords to gain access, suggesting they use “robust” passwords. Typically, this means making them at least eight characters and combining upper and lowercase letters with special characters and numbers. Those Air Canada app users can contact Canadian Travel and Tourism regarding the safety of their passport data. However, those 20,000 compromised customers also need to be aware of continued attacks by hackers using their PII. Much like many others whose data was stolen one way or another, there’s the need to be keenly aware of extended and ongoing attacks using their pilfered PII. Below is one of the most widely used attack after one’s PII is stolen. 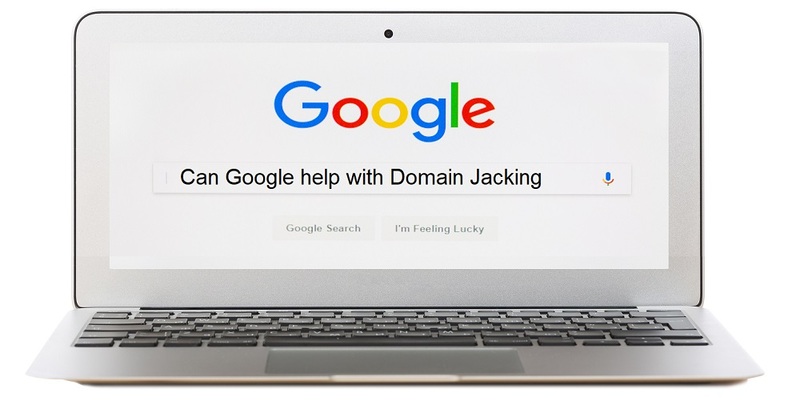 One of the most frequently successful hack attacks out there are targeted phishing attacks. Hackers use your stolen PII for laser-focused email phishing tactics. They’ll use your stolen PII to send emails subjects that look legit and target you personally. After opening the email, users are often asked to click on a link or open attachments. There’s no doubt those links and attachments are laced with malware, and that opens the door to even more data theft. Hackers have no conscience and they will take advantage of stolen PII to steal even more valuable PII. Often, they send phishing emails to victims offering “legitimate” services helping those who were hacked. They often look like they’re from your bank and other financial accounts. Remember this: Never take that bait. If you’re truly concerned about its legitimacy, pick up the phone and call the service in question. Never use a phone number provided in the email, it’s likely connected to the hacker. The need for vigilance is always necessary, but it becomes even more crucial after one’s data is hacked.